American psychologist; born Jan. 30, 1863, at Warsaw, Poland. He accompanied his father, Dr. Marcus Jastrow, to the United States in 1866, and was educated in Philadelphia. In 1882 he graduated from the University of Pennsylvania and took the degree of B.A., in 1885 that of M.A. ; at Johns Hopkins University he became fellow in psychology (1885-86), and in 1886 took the degree of Ph.D. In 1888 he accepted the chair of psychology in the University of Wisconsin, which position he still (1904) holds. He was placed in charge of the psychological section of the World's Columbian Exposition, Chicago, 1893. For the year 1900 he served as president of the American Psychological Association. 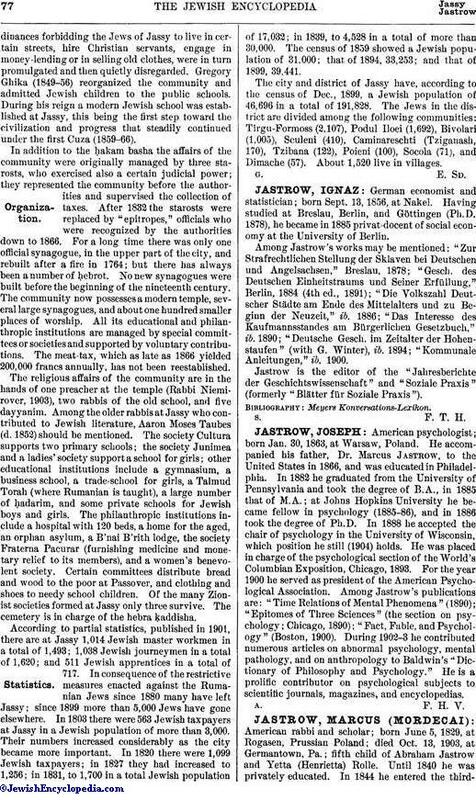 Among Jastrow's publications are: "Time Relations of Mental Phenomena" (1890); "Epitomes of Three Sciences" (the section on psychology; Chicago, 1890); "Fact, Fable, and Psychology" (Boston, 1900). During 1902-3 he contributed numerous articles on abnormal psychology, mental pathology, and on anthropology to Baldwin's "Dictionary of Philosophy and Psychology." He is a prolific contributor on psychological subjects to scientific journals, magazines, and encyclopedias.